To understand what happens in eye disorders, it helps to first understand how the eye works. The eye is a ball covered with a tough outer membrane. The covering in front is clear and curved. This curved area is the cornea, which focuses light while protecting the eye. Like the film in a camera, the retina records the images focused on it. But unlike film, the retina also converts those images into electrical signals, which the brain receives and decodes. In effect, we “see” in our brain, using information sent by our eyes. 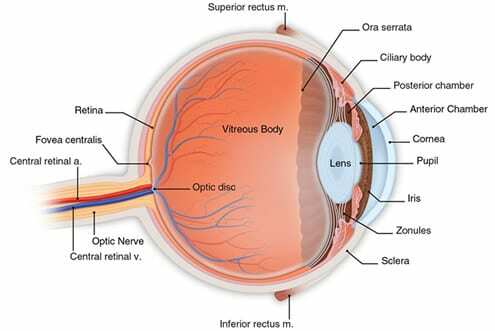 One part of the retina is specialized for picking up fine detail. This tiny area of extra-sharp vision is called the macula. Blood vessels in and behind the retina nourish the macula. The smallest of these blood vessels are the capillaries.